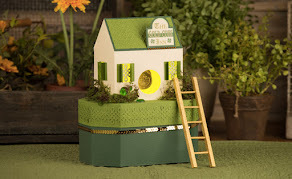 Brigit's Scraps "Where Scraps Become Treasures": Remember The Magic, Trendy Twine Celebration!! Hey everyone, today is the big release of Trendy Twine's 50th color Celebration, Yay!! and for Disney fans well just take a look!! 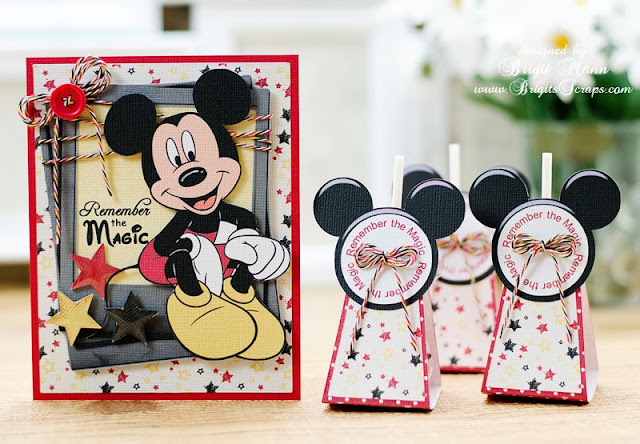 Our group theme is Disney of course, so make sure you hop on over to the Trendy Twine Blog and look at all the wonderful projects the Design Team made using the new Celebration!! 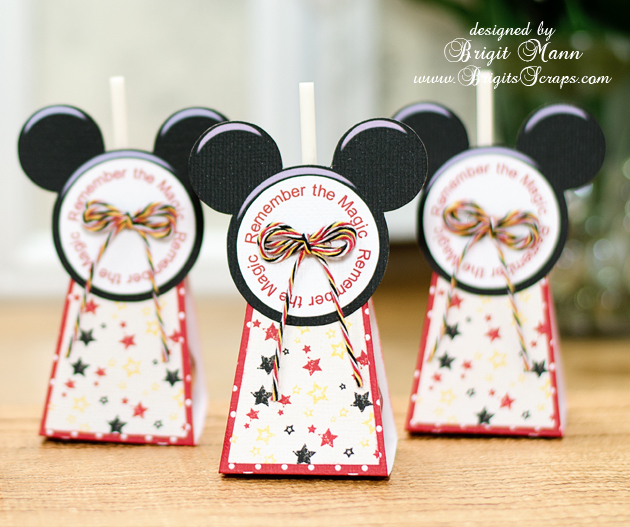 I made a Mickey card/invitation and some lollipop holders, perfect for a kids party. 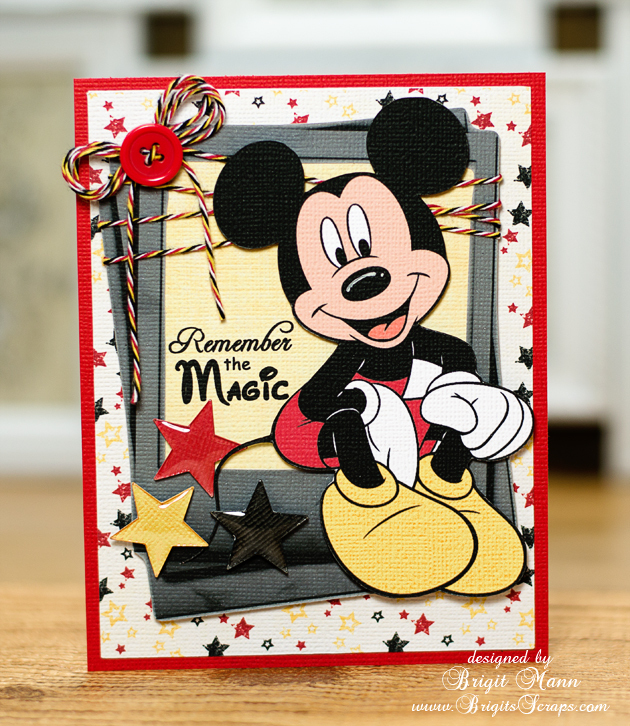 See how the colors match Mickey perfectly, love it!! 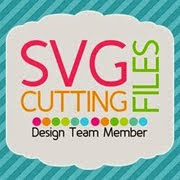 I used my Silhouette Cameo to cut out all the pieces and the digital paper. Mickey and the polaroid frame are from a kit by Frog Junkiee's Creative Creations and the digital paper is a freebie kit you can download here, which the sentiment is also from. For the stars I used my epiphany tool with the star bubble caps. I love these lollipop holders, I downloaded them from Okieladybug's Scrap N' More's blog, go take a look, she has so many wonderful projects and is very generous with her files!! Amazing as always Brigit, so bright and happy and perfectly perfect in every way! WOWZERS Brigit!! Your celebration projects are OVER the TOP awesome!!!! 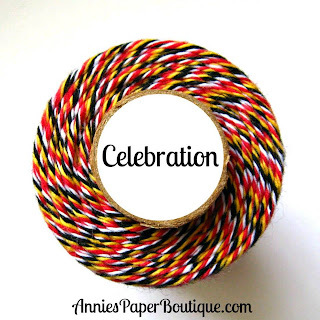 LOVE the digital papers (thanks for sharing the link) and look amazing with the new Celebration Trendy Twine! 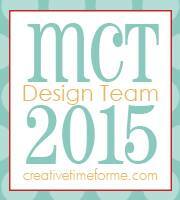 Another awesome project my friend! I just can't get over on how totally Awesome your creations is. Absolutely LOVE LOVE the lollipop holders too. Perfection. This is too cute! Love it! The twine is wonderful!! This is such a great card and I just LOVE the lollipop holders!! OMG!! This is so STINKIN cute!! I love both of them ADORABLE projects!! AMAZING!! you did such a GREAT job on these, Brigit!!! ANYONE would love to receive these!! Your project are amazing! Love those lollipop holders! Such an amazing card and treat holders. Everything looks absolutely gorgeous as always! Wow, wow, wow!!! I love both these creations!!!! The lolly holders are just too cute!! Heck the whole set is absolutely amazing! Hugs! 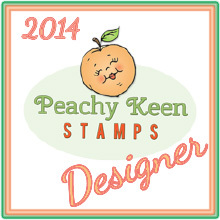 Thank you so much for this cute idea and file! !